Owly and Wormy want some butterflies! But when they come home from the nursery with a plant that will attract some fluttering friends, all that show up are fat, green bug things. Bug things are NOT butterflies! But, they are nice and fun and good at sleep outs under the stars and always up for a game of checkers. Fat, green bug might even be better than butterflies! Let’s be friends forever! But, the bug things can’t stay. When the bugs build their cocoons, Owly and Wormy think they have no friends left at all. They wait. And wait. And wait. And one day…their dreams have come true…and all a flutter! 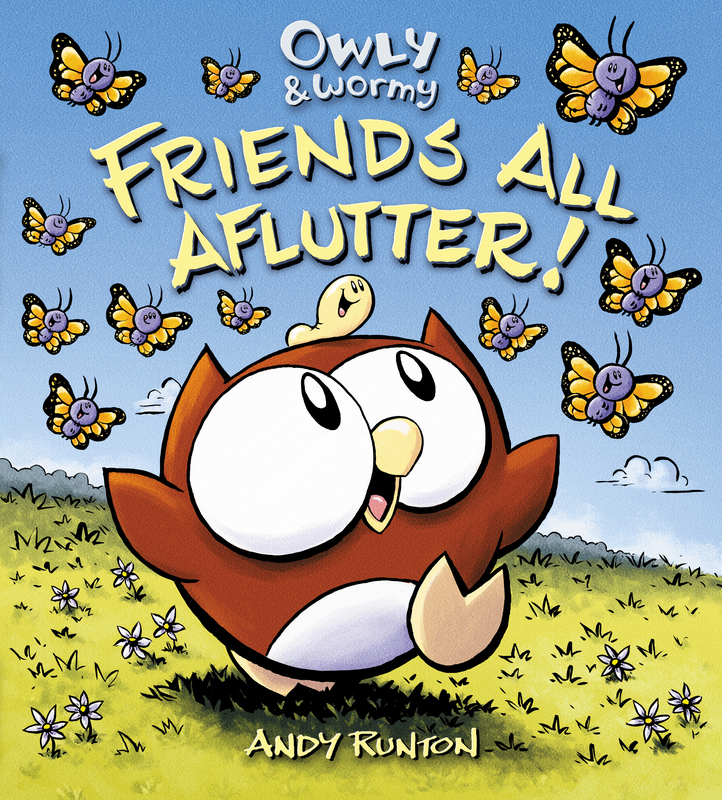 Owly’s friends are back….AND they've turned into butterflies. Bold, graphic and full of fun, this wordless storybook will give pre-reader the wings they need to start reading on their own, and a firm footing on the idea of metamorphosis. 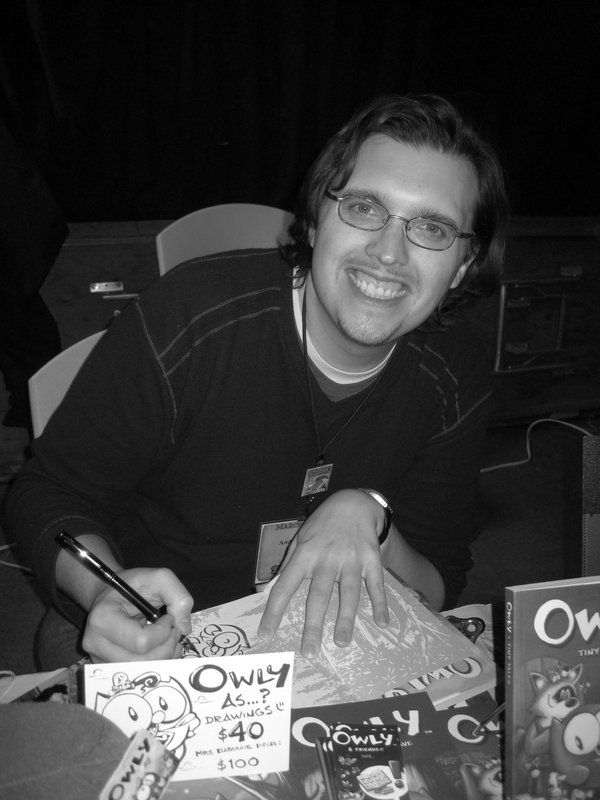 Fans of Runton's series of graphic novels know about Owly and Wormy's warm friendship and Owly's love for all living things. In the duo's first picture book, Owly learns that in order to attract the butterflies he yearns for, he must plant milkweed in his garden; however, he and Wormy are disconcerted by the caterpillars that show up. Since there's no text, their heated discussion is portrayed through speech balloons containing miniature illustrations and energetic punctuation: "[picture of milkweed] = [picture of butterflies]!" Wormy protests. "[picture of milkweed] ? [picture of caterpillars]!" "[Milkweed] = home," a baseball-capped caterpillar explains tearfully. Owly is a round ball with enormous, expressive eyes and pointy ears; tiny, blobby Wormy often perches on his head. Runton's colors are unabashedly cheerful--lemony yellows, sky blues, and velvety purple for night scenes--and clever, rewarding touches abound (when Owly gets a brainstorm, it's an efficient compact fluorescent light bulb that appears). Even very young children will be able to puzzle out the story's details from the expressions on the characters' faces, and Runton's unvarnished sentimentality creates an atmosphere of absolute security. Ages 3–7. Owly and Wormy, Friends All Aflutter!. Mar 2011. 40 p. Atheneum, hardcover, $15.99. (9781416957744). Wormy and Owly, the stars of Runton’s Owly comics, here make the leap into their first picture book. offering. The big cartoon illustrations? A blast! Book Cover Image (jpg): Owly & Wormy, Friends All Aflutter!